The delivery of your Christmas trees can be an exciting time. Their arrival renews the Holiday cheer, excitment, and traditions. On the other hand, they can also be overwelming if you are not prepared. Good this year. Please feel free to call with any questions or comments. Before your shipment arrives, it is very important that you communicate with the individual who is delivering your trees. We will provide you with this information before they depart from the farm. 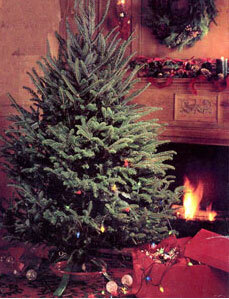 This will assure that you are prepared to recieve and promply store/display your trees and greenery. 1. Keep your trees shaded. Store trees in a shaded area. The North or East side of a building may work well too. Awnings, lathe houses, or shadecolth structures may be used if natural shade is unavailable. Do not leave bailed trees in the sun. Trees stored standing up have less exposure to sunlight and lose water less. 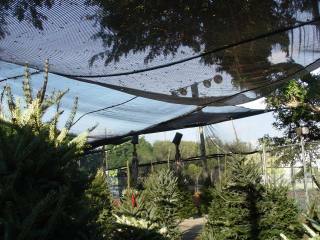 Store trees upright on sawdust or mulch to help retain water. Mist stored trees periodically to reduce temperature and minimize moisture loss. Trees displayed this way lose far less water and stay fresh. This will insure that the tree will take up water. Click here for a printable document of tree care instructions for your customers. 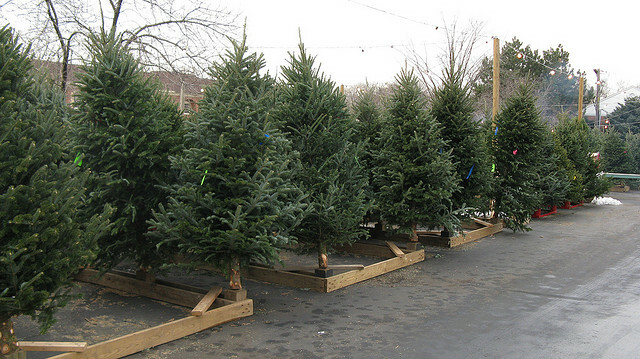 Numerous methods may effectively be used to store and display your trees. A few that we find very succesful are listed below. Freshness problems? Click here to help diagnose and prevent any problems. 1. The most effective storage method are “water troughs.” Being as delicate as fresh cut flower, the “shelf life” of your fresh cut Fraser fir is dramatically prolonged when you store your trees this way. Recycling greenhouse covers can save expense. 2. Another superb storage method is a tent. 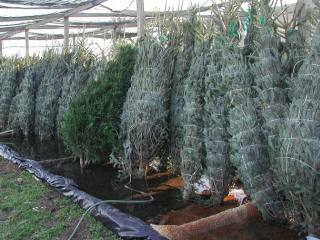 It may be used for storage only but is also a great place to display your trees. A tent will provide shelter during a rainy weekend when sales are key. 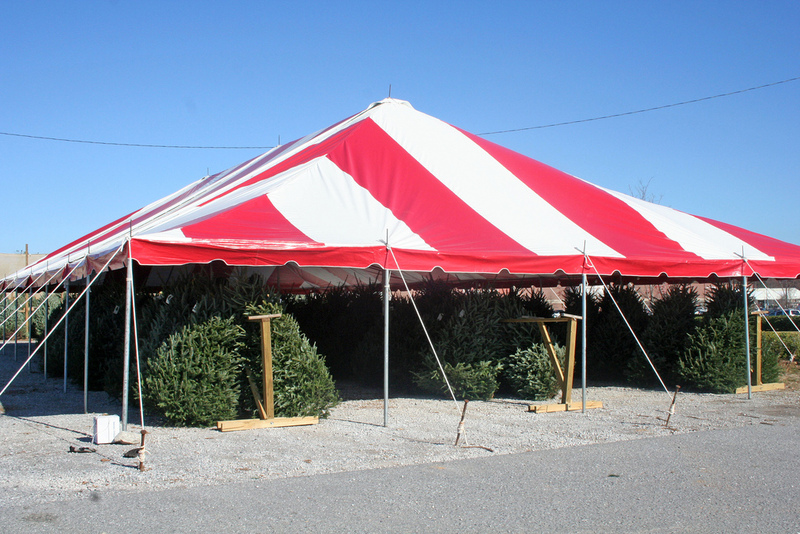 It can be set up in a parking lot or open field preserving precious retail floor space inside a garden center. 3. If you don’t have the space or resources to store your trees in “water troughs,” you can still display all your trees in water with a tree stand. 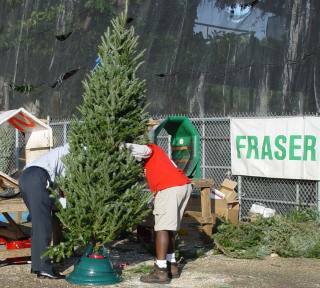 You can sell a tree with the stand as an incentive. You may consider offering a discount the following year if a customer brings their stand back. 4. Shade is your greatest priority. Shade cloth that blocks 85% of light or more has proven adequate. 5. Concrete and asphalt, unfortuately, are the most common “groundcovers” Christmas trees are displayed on. Keeping the pavement wet will reduce the heat radiated under the trees and will help to keep the humidy high around the trees.